Throughout this winter, many areas of the U.S. have experienced harsh winter conditions. Cold winds, sub-zero temperatures, and heavy snowfall have each taken their toll, and some areas have even experienced all three of these conditions. As many of us know, winter storms and harsh weather can cause many problems on your property, including damage to your trees. It is important for homeowners to carefully check their trees for damage once the winter conditions have subsided and spring weather has returned. If you notice major storm damage to your trees at the end of the winter, you should call a professional arborist to help clean up the damage. Winter weather can cause significant damage to your trees. There are several ways that winter weather can be damaging to your trees. The strong, cold winds can cause branches to break, the weight of ice and snow can put pressure on the branches, and sub-freezing temperatures can cause damage to the foliage. If winter storms have resulted in broken tree branches on your property, you can cleanup your yard by removing smaller branches that you can safely lift or break down. Large branches should be removed by a professional arborist that has the training and equipment to handle the tree removal safely. Trees that have been extensively damaged by sub-freezing temperatures may also need to be removed by a professional arborist. Many areas of the country, including the Midwest, experienced heavy snowfall this winter. The weight of snow and ice on trees can cause the branches to bend which can ruin their natural shape and even cause them to break. Some people may think that they can help their trees by knocking off the ice and snow with a shovel, but this can actually cause more harm to the branches. You should let the ice and snow melt naturally from the trees, so the branches can retake their natural shape. If only a few branches sustained damage, you can remove these branches with corrective pruning. If the top of the tree has sustained damage, prune it to the highest upright branch. If the trunk of the tree is heavily damaged or more than 1/3 of the branches are damaged, call an arborist to remove the tree. Prune broken branches to the largest branch or trunk that they are attached to. Cut with the blade side of your pruners towards the trunk or large branch and do not leave a stub. Make sure you cut the branches properly to prevent tree decay. If you are not comfortable pruning your trees yourself, a professional arborist can help. If the temperatures drop below freezing as a tree starts to leaf out, the freezing temperatures could cause discoloration or wilting of the foliage. The affected foliage will appear brown or black and within a couple of weeks, the tree may drop the foliage. Some trees can replace the dropped foliage with new buds which are there to replace damaged leaves that are dropped early in the season. If your tree has dropped foliage because of sub-freezing temperatures, there is nothing you can do except wait for the tree to grow out and see if it can replace the dropped foliage. Watering can help with this recovery, but over watering and fertilization can make this problem worse. If your tree hasn’t replaced the dropped foliage with new growth by late spring, it is unlikely to survive. A professional arborist can safely remove trees that cannot recover from freeze damage. Call an arborist to clean up serious tree damage. Be aware of any potential danger from fallen power lines and hanging tree branches. Do not touch tree branches that are touching downed power lines because you could get electrocuted. Tree branches that appear to be still attached may not be and they can fall at any moment. Evaluate your trees for damage. Look for broken branches, damage to the crown, split trunks and branches, and other forms of damage. Take minor steps to recover from the damage such as removing broken branches and pruning smaller branches to the closest larger branch. Any job that is too dangerous or beyond your ability should be left for an arborist. Cleaning up tree damage after a major storm can be difficult and dangerous without the right training and equipment. Professional arborists have the proper equipment to clean up tree damage and safely remove dead branches and heavily damaged trees. These professionals can prune your trees properly so that they recover from the damage, and they also know how to safely prune and remove trees near power lines. Calling a professional arborist will give your trees the best chance for recovery after a storm and help you avoid doing the dangerous work yourself. Hendricksen Tree Care is a professional tree care service provider that services Wheeling, Arlington Heights, Northbrook, Mount Prospect, Palatine, and Barrington, IL as well as the surrounding north Chicago suburbs. Their experienced arborists can help treat your trees that were damaged by winter storms and remove debris such as fallen tree branches. 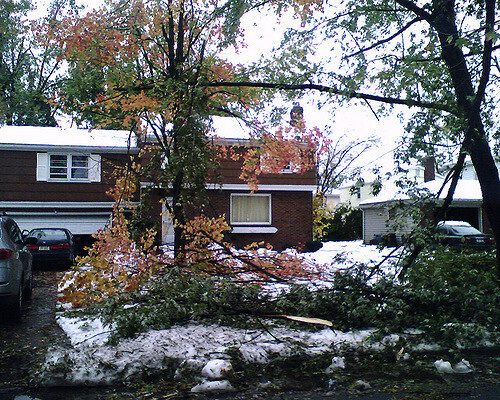 If you notice damage to your trees once the snow melts, contact Hendricksen Tree Care to help with the damage. Next story How can Sewage be cleaned up?